If you don't like zoos, they prove you have good reason. San Antonio Zoo's management must know, as so many zoos do, that the rationales zoos provide for imprisoning animals who are wild by nature are being questioned by an ever-better informed public, and yet look what they did. Flocks of egrets and other herons (egrets are a type of heron) have started nesting in trees over one of the zoo display areas. 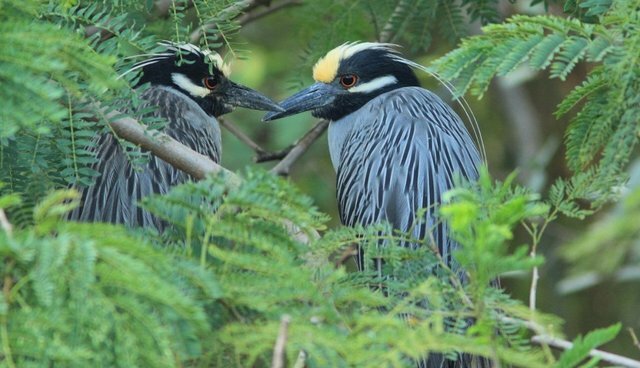 Actually, they had started by the time I visited the zoo a decade or so ago, and I was delighted to find a colony of yellow-crowned night-herons nesting above some of the waterfowl exhibits. Those herons are virtually unknown where I live, in Ontario, Canada, and as a zoo visitor I was pleased to see them, tame and confiding and, but for their ability to fly, often looking like other birds on display. I mean, I like to see animals and surely seeing animals is why zoos exist. Other heron species, including the lovely little cattle egrets, have also moved in and set up nest keeping above the zoo's Tiny Tot Nature Spot and Riverbank Beach. It was deemed to be too much nature for tiny tots and their picnicking families. I mean, herons don't use flush toilets -- but they regurgitate their food, squawk, molt feathers and, put simply, don't behave like a nicely sanitized and safely isolated bird in a cage. But what happened next was cruel, stupid and heavy-handed. While many people, like me, are willing to travel to where they can get up close to wildlife, I understand that zoos don't really provide anything approaching natural experiences. I get that. So while I might have hoped for an innovative approach, opportunistically providing a fascinating educational experience with blinds and signs, instead the zoo began to dismantle the colony. But they did so when the nests had live chicks in them! Yes, the chicks were taken from rightful parents and delivered to wildlife rehabbers, but, not only does that put a burden on and use up the resources of the rehabber, any rehabber will tell you that the best candidates for rearing baby birds are the actual parents of those baby birds. There aren't chicks all year round, so the time to take the nests down is as they are first being built, or to use scare tactics to chase the would-be nesters away before nesting starts. It was stupid if zoos are trying to prove that they serve some purpose other than entertainment. They claim to be interested in conservation, and when I was there I saw lots of signs bragging about their contribution to the captive breeding and release of whooping cranes. The whooping crane is one of a small, very small, suite of endangered species that is being restored in this fashion, but not by much, if anything, done at zoos. In fact, most of this work is done far from the public, often "in situ," meaning where the species being restored is native. Remember the outcry early this year when Copenhagen Zoo calmly killed Marius, a perfectly healthy male baby giraffe, because the zoo didn't need him? True, there was an offer to provide him a home, but the zoo didn't care. As those of us fed up with the myths zoos perpetuate well know, there really was nothing unique about Marius except the openness of the zoo authorities. Dr. Lesley Dickie, executive director of the European Association of Zoos and Aquaria, roughly estimated that between 3,000 and 5,000 animals are "management euthanized" by European zoos any given year, and we have no reason to think American zoos are any less bloody. And it was heavy-handed not only because the nesting colony, if so unwanted, could have been discouraged without orphaning baby birds and breaking up families (herons are devoted parents), but because it showed a pathetic lack of innovation and imagination. Picnic grounds and places for tots to play are important, yes, but vastly more commonplace than a viable colony of six species of herons, something that could well have been an attraction, not a liability. And yet zoos want us to think they care about animals. Talk is cheap, while action seems to demonstrate the opposite.